Start your child off with healthy brushing habits that will last a lifetime with this fun toothbrush set by Brusheez. 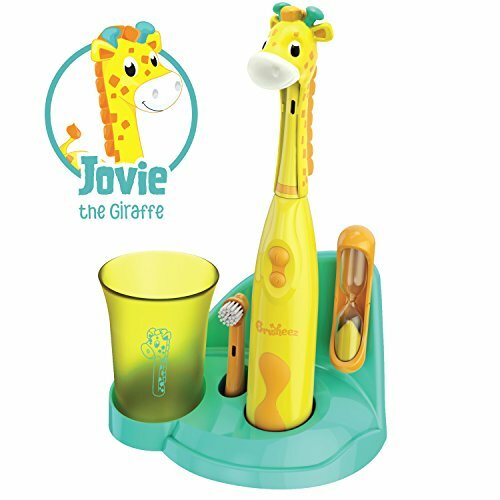 This complete set comes with everything young brushers ages 3 and up need to maintain a bright smile and healthy gums including a battery-powered toothbrush, protective brush cover, rinse cup, and extra brush head. Best of all, Brusheez includes a fun two-minute sand timer that offers the perfect visual cue for brushing the entire time that children's dentists recommend. Brusheez is CPSIA approved, food-safe, and our industry-leading 5 Year Warranty ensures your satisfaction is guaranteed. Soft head rotates at 4000rpm for a safe and effective brushing experience. Powered by 2 AA batteries (not included). Animal cover is not only adorable, but protects the brush head from dust, bacteria, and other germs. Includes an extra head of an opposite color to add some variation and teach children to replace their old brush head every 3 months. Makes rinsing before and after brushing a cinch. Sand Timer Easy-to-use timer teaches great habit and encourages brushing the two minutes that dentists recommend. Neatly and compactly organizes all Brusheez essentials - great for countertops but also includes materials to safely mount it to the wall. Helps your child keep track of his or her morning and evening brushing. Additional printable downloads of the weekly checklist are available for free at Brusheez.com. WHAT YOU GET: Battery-powered children's toothbrush, animal-themed brush cover, rinse cup, replacement brush head, 2-minute sand timer, stand, user manual, printed brushing chart, and industry-leading 5 Year Warranty. If you have any questions about this product by Brusheez, contact us by completing and submitting the form below. If you are looking for a specif part number, please include it with your message.